Unified shaders on a shoestring? You can bet your bump maps on it. 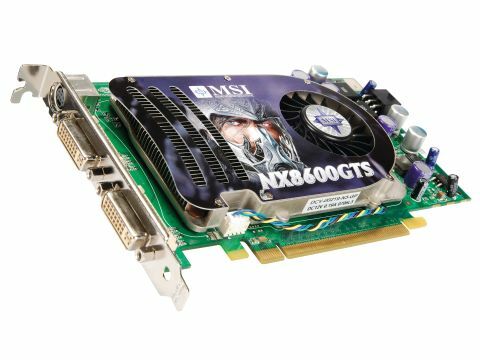 Priced at a mere £145, MSI's NX8600GTS - built around Nvidia's G84 core - is the first properly midrange-priced DX10-compatible card on the shelves. And there's still no competition for Nvidia's eight-series. As ever, we're propping up the bar and gorging on breadsticks while ATI's offering dallies at home, deciding which lippy to wear. Stood up or fed up? Take your pick. While team green's rapidly maturing stream-powered DX10 cores gains greater market penetration, we can't help but feel that ATI's New Hope will struggle to compete. This time next month, we'll know the true power of R600 though, and we'll be the first to ejaculate streams of bunting if it turns out to be the killer app for DX10. In the meantime, Nvidia's board-manufacturing partners are laying on a feast of midrange DX10 fancies, starting with the 8600GTS (more on the others in the family, namely the 8600GT and the 8500GT, next month). The first thing you notice about the 8600 is that, unlike most modern cards, it's refreshingly compact and quiet. This little fellow is the same width and length as its DX9-based spiritual predecessor, the 7600GT. And MSI's take on the 8600 comes pre-tweaked to run a little faster straight from the box. The standard core/memory speeds for the G84 core - housed in any vanilla 8600 card - are 675Mhz and 2GHz, whereas the NX8600GTS runs at 690MHz on the core, while the memory shoulders electrons around at a refreshingly spry 2.1GHz. Hardly a nut-clutcher of an increase, but every little helps. Architecturally, it's not far removed, although notably less powerful, than its big brothers in the 8800 range. The core is composed of 64 stream processes - compare this with the 8800GTS' 96, or the GTX's 128. And not only does it feature less memory, 256MB of DDR3 to be exact, but the memory bus is just 128-bit, compared with the 256-bit bus of the 8800s. Memory bandwidth is also low, at 28.8GB/s. The X1950 offers 44.1GB/s, and that's a six-month old DX9 card. On paper, none of it seems to paint a pretty picture. But bear in mind that this card is half the price of an 8800GTX. And here's another thing: stream-processor architecture is very different from variegated pipelines. So much so that comparing numbers with DX9 cards doesn't really get you anywhere. Despite all these unassuming numbers, the 8600 manages to outperform its main price-bracket peer, the X1950 Pro, in most tests. We ran in-game DX9 benchmarks at 1280 x 1024 and 1680 x 1050, the standard native resolutions of today's 19-22-inch panels; any higher than that is high-end card territory, and you'll be guaranteed disappointing results. In most game tests, it's clearly the superior midrange choice. 72fps in Quake 4 at 1280 x 1024 is good in anyone's book; certainly better than the X1950 Pro's 58fps. Likewise, it garners some very healthy 3DMark06 scores that you wouldn't really expect from a sub-£150 card. Oblivion is where the stream processors really shine, however. These scores are high-end territory, and are unmatchable by almost any GPU up to the £200 price range. What's puzzling is the Company of Heroes framerate, in which the card is outperformed by the X1950 Pro - by nearly 30fps, in our 1280 x 1024 test. It's baffling - in every other test, the 8600 is the head-and-shoulders winner. This doesn't make the game unplayable - far from it - but it's a curious downturn in performance. We can only assume that the 128-bit memory bus, and the relatively low-sounding memory bandwidth, are the culprits. You may have noticed in the box to the left that we've included 8800GTS 320MB scores as well. Under any other circumstances this would be a mismatch but we ran benches on this card because, in terms of current DX10-compatible offerings, it's been the best price/performance compromise yet. And the fact is, it's only £60-odd more than the 8600, and gives better performance. If you're looking for a DX10-ready card on a budget, then we'd suggest you stump up the extra for the baseline 8800 card, as you'll certainly notice the gains. But as it stands, despite the curious depression in the Company of Heroes scores, the NX8600GTS is still a class-leading midrange card. A year back, you'd have needed to spend around £350 to get the kind of Oblivion scores the 8600 is capable of. We're looking forward to popping a pair of these in an SLI setup to see what they can do.